Pioneers in the industry, we offer VU GST Accounting Software and VU GST ERP For SME from India. 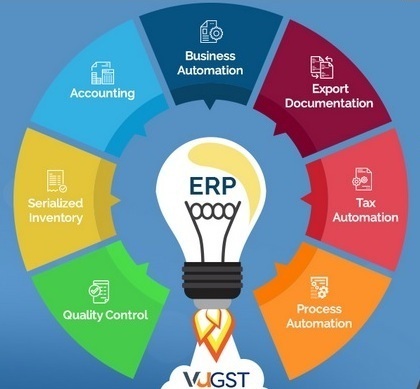 vuGST- ERP for small businesses at a one time charge of Rs 3599*/user with add-on modules for Inventory Management, Export Documentation & Quality Management system. Take your business to the next level by automating your processes, optimizing your resources and by using comprehensive analytics. vuGST is ahead of all its competitors in terms of technology and economical pricing. It has customized ERP modules that could help the industries to reduce compliance burden. So any Manufacturing or SME with ERP requirement would find this tool tailor made for their requirement. Export of goods is filled with a lot of paper work, documentation and along with that the generation of invoices staying complaint to the countries Tax policies is a bit difficult. Which is why EXIM makes it simple and easy for you. Quality Control / Inspection module is used commonly to collect and analyze data from every test run or procedure and to classify the Material received as Accepted, Rejected, Re-Work, and Casting Defect as per technical parameter set by the company. It is very important to check the quality of Material and maintain Stock according to quality as they are the deciding factors for brand reputation. Used in service industries where each Item has unique serial no which also needs tracking of these materials of its production date and expiry date and other details can be stored. Items are stored as separate entry having a unique Batch no. Batch date, other specific details based on the production.